This walk: 2016-3-31. Sheeps Tor, Narrator, PCWW 1919 pillars, Cuckoo Rock, Down Tor, Great Mis Tor, Combeshead Tor, Cumulus radiatus, Gutter Tor, Leather Tor, Higher Rough Tor, Lower Rough Tor. PCWW stone, SX 57292 68358 = Plymouth Corporation Water Works, erected in 1919 ro mark the edge of the catchment area of Burrator Reservoir (opened 1898); most are inscribed 1917 although there are four at Princetown inscribed 1932. Another stone nearby at SX 57425 68354. Looking down on the corner of Roughtor Plantation at SX 577 683. Zoomed view to Cuckoo Rock. Zoomed view of Down Tor. Zoomed view to Great Mis Tor, with a little camera shake. Zoomed view to Sheeps Tor. Zoomed view to Combeshead Tor. The mine shaft at the corner of the plantation. Hollow pan in the top of the tor. Final view of Lower Rough Tor. Our thanks to Paul Rendell for pointing us towards the lower tor. 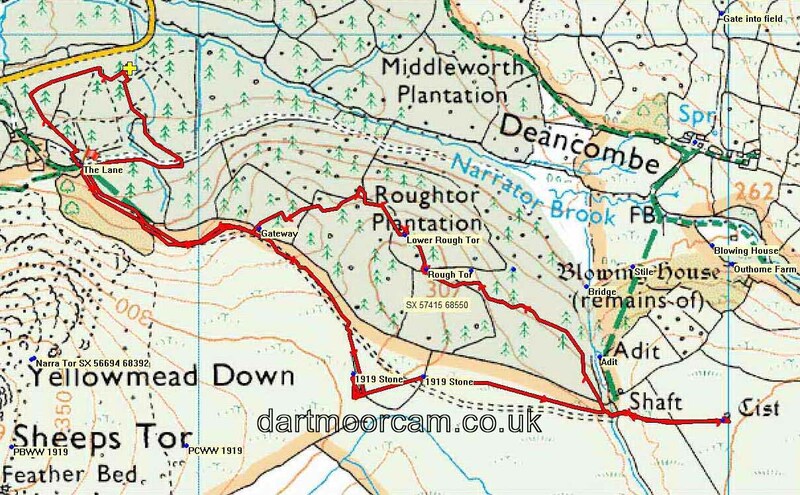 The walk was accessed from the B3212 road from Yelverton to Dousland, turning right at the Burrator Inn to Burrator Dam, driving past Norsworthy Bridge to the Arboretum car park at the yellow cross on the map. There is a shorter route by going over the dam and turning left before Sheepstor village - the roads here are quite narrow. Distance - 4.31 km / 2.68 miles.